Emmett Rogers, born October 11, 1867 in Hot Springs, AR, was a professional baseball player from 1887-1898. Rogers was the first confirmed Arkansas-born player in the major leagues. Much of Roger’s background is unclear. His birthplace was for many years listed in baseball records as New York, though this was changed when his researchers discovered his obituary, which gave his birthplace as Hot Springs, AR1. Newspapers contemporary with Rogers’ playing days give various other birthplaces, including Springfield, IL2, and Roxbury, MA3. Sources do agree, however, that Rogers grew up in Hot Springs. His parentage is uncertain, though he was raised in the family of John and Mary Sammons4. In his youth, Rogers worked in his uncle’s grocery store5 and played baseball with Hot Springs amateur teams3. He became well known as a skilled catcher, and several teams sought out his ability. In June, 18846, when Rogers was only 16, he was recruited by a Little Rock, AR team known as the Shorts to play in a big game again Hope, AR7. 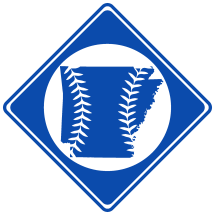 A year later in August, 1885, he returned to Little Rock to play with the Arkansas Travelers, a well-known amatuer club. 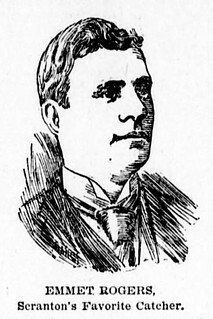 In 1887, Rogers played with Hot Springs in the minor league Southwestern League. From there, he began his professional career, which included a stint with the major league Toledo Maumees of the American Association. 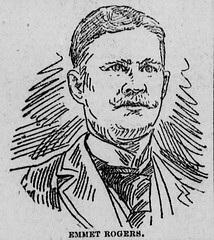 Rogers, Los Angeles Herald, 3/22/1892. 4. Rogers' obituary states that his sister is the wife of Al Belding of Hot Springs, AR, or namely, Violet May Sammons. In the 1880 U.S. Census, Violet is living with her parents, John and Mary Sammons, and an older brother listed as "Emmett Sammons", age 12. It appears this is Emmett Rogers. It seems likely that Emmett may have been the son of Mary Sammons by a previous marriage. 5. Emmett's uncle was Shad Allen Sammons, a well known Hot Springs grocer. Sammons was the brother of Emmett's stepfather and possibly the husband of his mother's sister, Harriet Emily Ely Sammons.